According to the latest market report published by Transparency Market Research titled “Collapsible Metal Tubes Market: Global Industry Analysis, Size, Share, Growth, Trends and Forecast, 2017-2025,” squeeze type collapsible metal tubes segment is expected to be the largest contributor to the global collapsible metal tubes market revenues over the forecast period, 2017-2025. 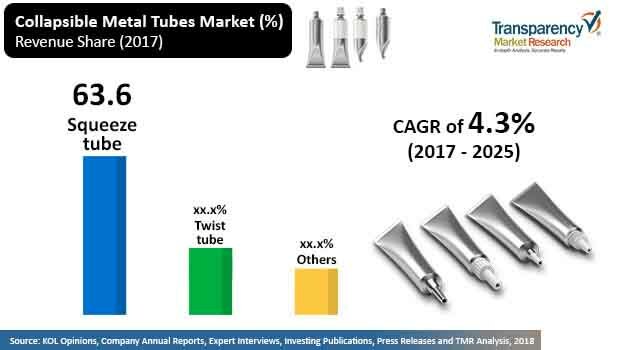 Globally, the revenue generated from sales of collapsible metal tubes was registered to be around US$ 1,069.4 Mn in 2016, which is projected to increase at a CAGR of 4.3% by the end of 2025. Exploding global urban population and increasing concern among consumers regarding the ill effects of plastic packaging on environment has propelled the market for collapsible metal tubes. Manufacturers of collapsible metal tube are focusing on expanding their production capacity in order to meet soaring demand, either by adding machinery to the manufacturing facility or by acquiring emerging small and regional collapsible metal tubes companies. Besides increasing global production of collapsible metal tubes, the requirement of establishing high brand value in the market has driven the sales of collapsible metal tubes. Especially in the cosmetics sector, the innovative formats of packaging keeps evolving across the globe. In addition to that, the superior barrier traits of collapsible metal tubes are also fuelling the market expansion. However, due to the rapid expansion in the production capacity of collapsible metal tubes around the globe, the problem of over capacity is also rising as the required production capacity to meet the global demand of collapsible metal tubes has reached to around 80% of the present production capacity. Moreover, increasing pace of plastic tubes replacing collapsible metal tubes has also to a large extent restrained the growth of collapsible metal tubes market. Moreover, the slower acceptance rate of collapsible metal tubes in developing countries of Asia Pacific and Middle East & Africa is the reason for low per capita consumption of collapsible metal tubes, while the demand for the same is expected to rise at a considerable pace. China and India are the producers of moderate quality collapsible metal tubes at very low prices as compared to the ones manufactured by European and North American manufacturers. Thus, a large portion of collapsible metal tubes demand in the region is served by low cost collapsible metal tubes produced by regional players. Furthermore, the growing unit dose or single use application of these collapsible metal tubes is also restraining the market’s growth. Although, the key global players of collapsible metal tubes market have made the market highly competitive for the smaller and emerging players to sustain in the market, the private label brands of collapsible metal tubes are also experiencing considerable growth. Thus, the increasing market for nationwide retail chains and their attraction towards the collapsible metal tubes market has created ample opportunities for the collapsible metal tubes market players. In terms of opportunity created by the geographical regions, the Asia Pacific is expected to create very high opportunity for the market. This is due to more than twice the demand of collapsible metal tubes originating from the pharmaceutical sector in the region. Thus, Asia Pacific creates a lucrative market for the global collapsible metal tubes firm to export to the region, and also for regional players to emerge in the region. The market volume for global collapsible metal tubes is expected to expand 1.4X over the forecast period 2017-2025. Some of the notable players operating in the global collapsible metal tubes market include Montebello Packaging, Auber Packaging Co., Ltd., Andpak Inc., Adelphi Healthcare Packaging, Linhardt GmbH & Co. KG, CONSTRUCT Packaging, SUBNIL Packaging Machineries (P) Ltd., Universal Metal Products, Antilla Propack, Essel Propack Limited, Albéa S.A., PAKET CORPORATION, D.N.Industries, ALLTUB Group, Perfect Containers Pvt. Ltd., Hubei Xin Ji Pharmaceutical Packaging Co., Ltd., Jiujiang Deshun Adhesives Co., Ltd., PIONEER GROUP, IMPACT INTERNATIONAL and Almin Extrusion. The report analyses the global collapsible metal tubes market in terms of value (US$ Mn) and volume (Mn Units). The global market for collapsible metal tubes is segmented by product type, by closure type, by capacity type, by end-use and by region.